TD IRIE Music Festival, a multi-day, multi-venue summer music festival proudly celebrates its 12th Anniversary year in 2014. FREE if you are wearing a Toronto Carnival Costume on August 1st. Get excited about 11 days of Canada’s most innovative and original performance, the latest and greatest in performance making and breaking. The Krinos Taste of the Danforth is Canada’s largest street Festival, welcoming approximately 1.6 million attendees annually. The Festival is celebrating its 22nd anniversary and this year the Festival is even bigger and better than ever before – with dozens of free activities for visitors of all ages. Join us at the inaugural Lovin’ Local Food Fest – a celebration of local and sustainable food and drink in the heart of downtown Toronto. Admission is free! Innovative foodies, restaurants, celebrity chefs, chef competitions, live music, kids’ activities and more – a full day of fun, food and celebration. The TD Festival of South Asia creates a window into the East to celebrate and experience the culture and cuisine of South Asia. It takes place August 15 & 16, 2015 in Gerrard India Bazaar from noon-11:00 p.m. The CNE has been a summer tradition for generations, dating back to 1879! In addition to the rides and Tiny Tom’s donuts, one of the attractions is always whichever decadent treat the vendors have come up with this year! 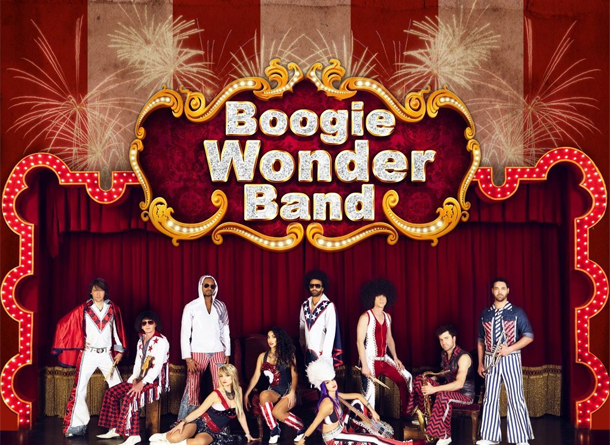 Pictured above, the Boogie Wonder Band, bringing back the hits of the 70s. This year’s theme for the Toronto Chinatown Festival is the Forbidden City. The Toronto Chinatown Festival is proudly presented by TD bank and is hosted by the Chinatown Business Improvement Area (CBIA). We are excited to present you the first and only festival in Canada that highlights of one of the greatest fruits in the world, the coconut! Experience the sights and sounds and immerse your senses in the wonders that it brings. The Toronto International BuskerFest for Epilepsy returns to the Downtown Yonge Neighbourhood for another excitement-filled year. The longest and most vibrant street in the world is a perfect venue for the largest epilepsy event in the world and North America’s largest Street Performer Festival! Since 2008, The Toronto Burlesque Festival has been bringing the most exciting international and Canadian headliners to the stage. Toronto performers are prominently showcased and have joined the ranks of the world’s best since the festival’s inception. Now in its eighth year, the Toronto Burlesque Festival is four day whirlwind of performances, parties and workshops – not to be missed! The festival runs Thursday, August 27th to Sunday, August 30th, 2015 with key events at Revival Bar and Virgin Mobile MOD Club.